This is Hydrangea Grandiflora Paniculata “White Diamond” in early morning sunlight. (The purple flowers in the background are fragrant phlox.) Once my “diamonds” come into full bloom, I feel like summer, though not over, is starting to wind down and that I had better remember to enjoy the rest of summer while it lasts. 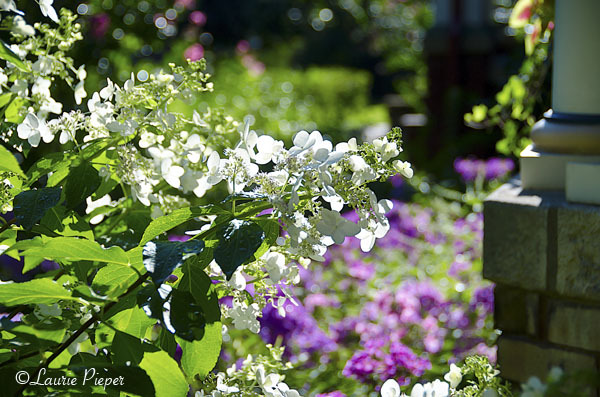 This entry was posted in Gardening Images & Tips and tagged Gardens, Hydrangeas, nature, Photography, Summer, White. Bookmark the permalink. Flowers bring me such peace, such joy. I love being in nature! One of my goals is to own a home surrounded by nature. Sounds like a lovely goal. When we bought our house, we dug up all of the turf grass and replaced it with gardens. I enjoy the gardens very much, but they are more work than lawn.